This is a well written study of 1 & 2 Samuel. It digs deep into a Christ-Centers concept which is that the Bible is a Christ-Centered book. I will describe the book a little. It's 381 pages long and measures 8.25 X 5.5 X .875 (inches). I include this to let you know that it's a perfect size to hold in your hand to read. I will say that this book was not what I expected, but was pleased none the less. The major characters that are discussed is Hannah, Samuel, Saul and David. I have to admit it opened my eyes to Hannah's plight and the fact that a nation was praying for a savior while Hannah, in her bareness, was praying for a child. This was a concept that just hadn't occurred to me. It next goes into Samuel as a point of leadership and choosing Saul even though he was rebellious against the God. It weaves it's way to David, the second King of Israel, the king God choose and one after his own heart. This book has 24 different sections with a set of reflect and discuss section at the end of each. I used this as a weekly study, a section a week with reflection at the end of the week. While this is a great book it is more designed for a person in a leadership role such as a pastor or the leader of a small study group which it was designed for. I would definitely recommend it for anyone in one of these roles. For me it was a little too difficult to use as a individual study. It is well written and brings out many important issues and gave me a different perception on these written characters and events. I received this book from B&H Publishing. I was not required to post a positive review. All thoughts and opinions are my own. 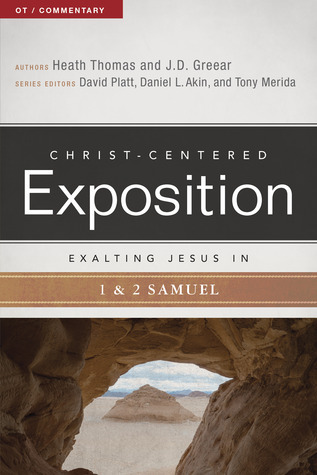 `Exalting Jesus in I & II Samuel` is an Old Testament study written by authors Heath Thomas and J.D. Greear. It is also an Old Testament commentary. I & II Samuel reveal God's plan for King Jesus. They are also mirrors of our modern world, with sin running rampant and people turning their backs on God only to reap the results. The major characters are Yahweh, Hannah, Samuel, Saul, and David. Samuel Samuel is a prophet, priest, and judge of God's people. Saul is the first king of Isreal. David is the second king of Israel, a king after God's own heart. The topic of the book is that of exalting Jesus. The author approached this subject descriptively. Beginning and ending with Jesus - Yahweh.The introduction is longer than most, but very important background to the book. In I & II Samuel God promises salvation through a royal line of David, Israel's anointed king. (see page 20) I have read the books of Samuel a few times and did not realize that God came and stood beside Samuel then called out to him. I always assumed God was in heaven calling for Samuel, but verse 10 in I Samuel chapter 3 reads God came and stood. I also learned true repentance is when we fully trust in God and are fully satisfied in God. If we don't grasp those two things we don't really know God. Either we do not know God's gracious love for us, or we do not grasp the value of that love (see page 173). In I & II Samuel we see the demise of Saul and the rise of King David, a man after God's own heart.I recommend this book to all believers.Disclaimer: "I was provided a free copy of this book. All opinions are my own." J.D. Greear Heath A. Thomas David Platt Daniel L. Akin Tony Merida - J.D. Greear, Ph.D did his degree work in Christian and Islamic theology at Southeastern Baptist Theological Seminary in Wake Forest, NC. He is Lead Pastor of The Summit Church in Raleigh-Durham, NC. The Summit’s vision is to plant 1,000 churches in by the year 2040. Currently, they have planted 11 and have several church planting teams stationed around the world.